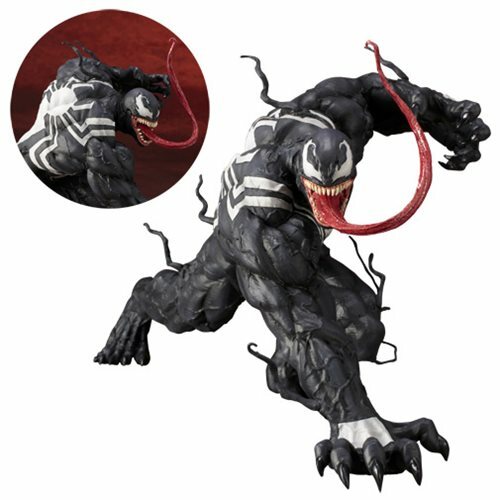 Venom joins Kotobukiya's ArtFX+ 1:10 scale statue lineup. The alien symbiote is ready to strike! Magnets in his feet add stability on the included base. Alien symbiote Venom is depicted in a low stance, ready to strike with his claws. Based on artwork specifically commissioned for this series, this stunning 1:10 scale PVC statue displays perfectly along with other Spider-Man ArtFX+ statues (sold separately) to create exciting battle scenes. The Spider-Man Marvel Now! Venom ArtFX+ Statue includes magnets in his feet for extra stability on the included base and comes packaged in a closed box. Ages 15 and up.